"Now that I'm pregnant, is it true that I should limit the amount of fish I eat or avoid eating it altogether because of the mercury content?" As dietitians, you've probably heard this question often from your clients. What an opportunity you have to educate them about the health benefits of fish, especially now that the FDA and Environmental Protection Agency (EPA) have released updated recommendations on fish consumption. In January, the agencies issued final advice on fish consumption for women who are pregnant, breast-feeding, or may become pregnant, and parents of young children. The advice recommends eating two to three servings of lower-mercury fish per week, or 8 to 12 oz. Children starting at age 2 are recommended to eat fish once per week in smaller portions (eg, 2 oz) according to their age and total calorie needs. The reason for the push to eat more fish is because it's associated with improved heart health and infant neurodevelopment. In fact, pregnant women who eat two seafood meals per week could give their children an additional 3.3 IQ points by age 9. What's different about these updated guidelines is that the FDA and EPA have provided a handy reference chart that sorts out 62 types of fish into three categories: best choices (eat two to three servings per week), good choices (eat one serving per week), and choices to avoid (highest mercury levels). Some of the best choices of fish are the most commonly eaten among Americans such as shrimp, pollock, salmon, canned light tuna, tilapia, catfish, and cod. Fish with higher mercury levels to be avoided include tilefish from the Gulf of Mexico, shark, swordfish, orange roughy, bigeye tuna, marlin, and king mackerel. The chart will be a valuable tool for dietitians to use in hospitals, private practice, schools, supermarkets, and other venues to educate consumers about the types of fish they should eat and in what quantities. The FDA and EPA are urging all supermarket retailers to post the reference chart to make it easy for shoppers to make the right choices when purchasing fish. Dietitians can print out the chart at www.fda.gov/Food/FoodborneIllnessContaminants/Metals/ucm393070.htm#print. In addition, the agencies are launching a consumer education campaign to spread the word about the new recommendations. To learn more about the health benefits of fish and what you should tell clients, turn to "Fishing for Answers" on page 16. 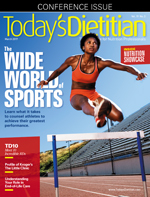 In honor of National Nutrition Month® and Registered Dietitian Nutritionist Day, Today's Dietitian is publishing its eighth annual "TD10" feature, which includes profiles of the top 10 winners you helped nominate for their hard work in the dietetics field. Enjoy reading their stories and the other articles on sports nutrition, Kroger's The Little Clinic, and end-of-life nutrition. Please enjoy the issue!